It can be frustrating that so many novels by African writers published in the West focus on the experience of emigrants in America, often echoing the choices of the author, rather than life in their home country. It would be unfair, however, to label Nigerian writer Chimamanda Ngozi Adichie as only interested in the expatriate experience. Her first novel, Purple Hibiscus, was a coming of age story set in Nigeria; her second, Half of a Yellow Sun, an ambitious exploration of the Biafran War. As its title suggests, her third novel, Americanah, tells of the Nigerian exodus to the West, with many of its characters fixated on making it to, and in, America. Adichie has shown herself adept at tackling important themes within the context of straight-forward story-telling. Americanah is, at heart, a love story. Its two main characters, Ifemelu and Obinze, are a teenage couple who become separated when Ifemelu travels to America to study. The assumption is that Obinze will follow, particularly as America was always his dream rather than hers (he will read only American novels). However, after 9/11, he is refused entry and instead must settle for illegal immigrant status in England. During this time they lose contact, and only years later will they see each other again. On this rather frail plotline, Adichie hangs a great deal of weight, exploring both the issue of race in America and the development of Nigeria over a twenty year period. Adichie capture the style of the blog well, although this does create a clash with her own much more measured prose. Another difficulty I found was that there is little to suggest much authorial distance from Ifemelu’s views suggesting that the blog simply allows Adichie to articulate her observations on race directly. These are always interesting, as are the many observations Ifemelu makes about America in general, but can seem, cumulatively, condescending, whether it’s her shock that a child doesn’t know oranges have seeds, or her criticism of other students’ poor grammar. Both Obinze and Ifemelu return to Nigeria – Ifemelu because of the “cement in her soul.” Adichie presents us with a picture of a country where there is a huge divide between the rich and poor, corruption is endemic, and success is largely a result of who you know (it’s a little bit like David Cameron’s vision for Britain). At this point, however, the focus is very much on Obinze and Ifemelu’s relationship. As the novel progresses, I found it harder and harder to root for what, at the start, are two very sympathetic characters. Obinze is now a wealthy property developer. He shares Ifemelu’s condescension, laughing at the rich elite he is now part of. Ifemelu, meanwhile, begins a new blog in Nigeria. Ultimately this is a novel of observation – and a very good one (though I suspect it might have made two better novels, one focusing on an immigrant’s perception of race in America and another on Nigeria). Its main characters, however, don’t seem subject to the criticism of those around them; nor do they seem interested in anything other than noticing the faults of others. 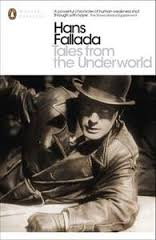 Michael Hofmann’s translation of Hans Fallada’s Iron Gustav seems to have been delayed until later this year, but in the meantime we have this collection of Fallada’s shorter fiction, Tales from the Underworld. As Hofmann points out, these stories take us through Fallada’s writing career, beginning with his first published story, ‘The Wedding Ring’, from 1925, and ending with ‘The Old Flame’, published after his death in 1946. Also included are a few pieces which did not appear in print until the 1990s. (These are found at the end of the anthology which is ordered by publication but with reference to their probable dates of composition). 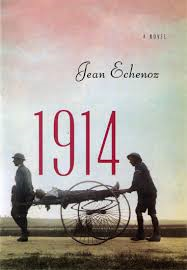 Disappointingly, for those who know Fallada through his most famous work, Alone in Berlin, there is a gap between 1935 and 1945, and therefore nothing which touches on the subject of that great novel. In ‘Happiness and Woe’ the unemployed husband spends the rent money: “It was like an illness. I don’t know what came over me.” It is his wife’s matter-of-fact forgiveness, however, that makes the story surprising. ‘The Lucky Beggar’ is another story that explores the desperation of the hunt for work. This is not to say that all the stories are gloomy and depressing, but even the happiest, like ‘Fifty Marks and a Merry Christmas’ tend to be about making ends meet. In fact, the ‘happy ending’ in this story is literally represented by a balance sheet. In all these stories relationships are important: rarely are Fallada’s characters loners facing their problems alone. Generally, and perhaps sentimentally, these relationships tend to survive poverty unscathed. In ‘The Returning Soldier’ the main character returns from the war with an injured arm that won’t bend. He tells his fiancée that they can no longer marry but “She was adamant that she didn’t want to let him go.” In the ensuing embrace, his arm begins to move again. Both the early story ‘Passion’ and the late story ‘The Old Flame’ (twenty years separating them) are about characters who cannot forget their first love. we feel that this could apply to a number of the stories. Others read as stories Fallada has been told, and are presented in unvarnished form as such. ‘Why Do You Wear a Cheap Watch?’ is literally an answer to that question; ‘On the Lam’ is the written down tale of someone Fallada met in prison. But it is this urgent realism that is often their main attraction. Few writers have described the lives of this in the ‘underworld’ as Fallada has, and this collection provides an excellent overview of that talent. 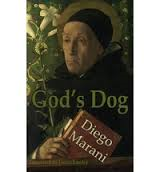 Don’t be fooled by the sombre portrait on the cover of Diego Marani’s new novel courtesy of 15th century Italian painter Giovanni Bellini: just as in the novel nothing is what it seems, the book itself seems to be saying “historical” while hiding a heart as dystopian as 1984. Marani shot to prominence when Dedalus published his 2000 novel, New Finnish Grammar, in English in 2011; this was followed in 2012 by The Last of the Vostyachs, which had appeared in Italian in 2002. Now we jump forward ten years as Judith Landry (once again) translates his latest novel, God’s Dog. The overall impression is of a restless, questioning mind with scant regard for genre. The church also suspects that the dying father of a wanted abortionist, Ivan Zago, is hidden among the patients and that this might flush Zago out of hiding. The novel then proceeds conventionally with meetings with his vicar ‘handler’ in the confessional, observations of staff and visitors, the identifying and following of a suspect – only now and then dipping into Salazar’s diary to discover his religious views are more complex than we might expect for a ‘dog’. This changes when the narrative begins to fracture and sections reveal Zago and fellow ‘terrorist’, Marta Quinz. At the same time the plot also starts to fragment: Zago is after revenge for his father’s treatment; Quinz and others are planning to disrupt the canonisation of Benedict XVI; and Salazar is suspected of being unfaithful to the church as a result of his friendship with an Islamic scientist, Guntur. It is perhaps difficult to fully appreciate the dystopian nature of the novel in the UK where the idea of a religious state seems unlikely (although Kingsley Amis wrote an alternative history where the Reformation didn’t happen and Europe is controlled by the Catholic Church). Much of the satire is directed at Joseph Ratzinger – Benedict XVI – who is quoted throughout and whose nickname was the Pope’s Rottweiler. This is also, however, a novel of ideas, articulating religion’s fear of science, and once again exploring the issue of language. The Catholicism it presents is ferocious and ruthless (like a dog) but also reasoned and calculating. Marani’s master stroke is centring the debate on an ambivalent character, one who is neither hero nor villain, and with whom the reader’s sympathies rise and fall. The more I read of Marani’s, the more interesting he becomes. You are currently browsing the 1streading's Blog blog archives for February, 2014.